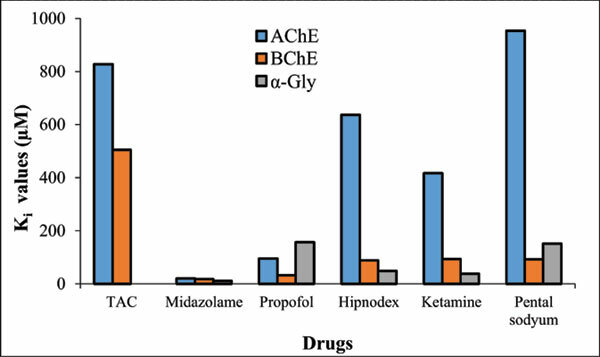 Background: The present paper focuses on the in vitro inhibition of some sedative drugs such as Midazolam, Propofol, Hipnodex, Ketamine, and Pental sodium on acetylcholinesterase (AChE), Butyrylcholinesterase (BChE), and α-glycosidase (α-Gly) enzymes. Methods: These drugs were tested in diverse concentrations, which showed positive effects in vitro AChE, BChE, and α-Gly activities. Ki values were 20.14, 94.93, 636.78, 416.42, and 953.75 µM for AChE, 17.52, 32.03, 88.02, 93.48, and 91.84 µM for BChE, and 10.87, 156.68, 48.21, 37.88, 151.01 µM for α-glycosidase, respectively. Results: An enhancing number of experiential observations show potentially harmful effects of sedative drugs on the extension of brain. Conclusion: Midazolam exhibited effective inhibitory activity compared with the other drugs for these enzymes. Sedative drugs, α-glycosidase, acetylcholinesterase, butyrylcholinesterase, enzyme inhibition, propofol, midazolam.